Russell Westbrook, who had his ninth career postseason triple-double in Oklahoma City’s Game 1 loss, finished with 14 points, nine rebounds and 11 assists. He was pulled with 3:31 with most of his fellow starters after Portland built a 112-91 lead. Portland’s victory in Game 1 snapped a 10-game postseason losing streak that included four-game sweeps in the past two seasons — first by the Warriors and then last year by the Pelicans. Lillard had 30 points in the 104-99 win on Sunday. Oklahoma City beat the Blazers in all four meetings during the regular season. The Thunder have been to the playoffs for eight of the last nine seasons, but they haven’t gotten past the opening round for the past two. Lillard hit a 3-pointer and was fouled to close the Blazers within 48-43. But the game began to get heated, with Lillard and Westbrook getting into it when Lillard tried to strip the ball. The officials reviewed it for a “hostile act” but concluded there were no fouls on the play. It was chippy for much of the game, and at one point Lillard and Steven Adams stared each other down after Adams set a screen on the All-Star guard. 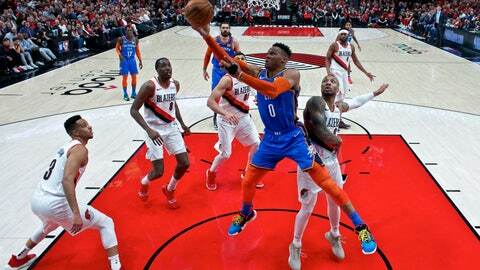 Westbrook collected three fouls in the first half and headed early to the bench, as did Portland’s Enes Kanter, who was so successful against the Thunder in Game 1. Together the teams had 29 fouls in the opening half and there were 54 for the game. Portland pulled in front on McCollum’s jumper and extended it to 69-63 with Lillard’s long 3-pointer. Seth Curry had back-to-back 3s to put the Blazers up 85-73 late in the third. The Blazers’ hopes for postseason success appeared to take a blow last month when center Jusuf Nurkic was lost for the season with a broken left leg. Nurkic was averaging 15.6 points and 10.4 rebounds when he sustained the gruesome injury during a game against the Brooklyn Nets. Kanter, signed just before the All-Star break after he was waived by the New York Knicks, has started in Nurkic’s place. Kanter had 20 points and 18 rebounds in Game 1 but finished with six points and five rebounds on Tuesday. At one point in the first half Kanter got knocked in the hand and X-rays at halftime revealed a contusion. But he said following the game that he’d be fine for Game 3. Thunder: Thunder coach Billy Donovan was emphatic before the game: “No injuries, no one out, no game-time decisions.” … It’s the first playoff series between the teams since the Thunder moved from Seattle to Oklahoma City. Trail Blazers: Seattle Seahawks quarterback Russell Wilson, who just signed a contract extension that makes him the highest paid player in the NFL, was among the fans at the Moda Center, as was Gonzaga coach Mark Few. … Jake Layman, who did not play in the series opener, came in to start the second quarter. Donovan said he’ll take a look at why the Thunder aren’t faring well from 3-point range. The team also struggled in Game 1, making just five of 33 attempts.